Craving steak one night, we Googled places in Chatswood which had good steak. The search came back with Cafe New York. They have 2 stores open in Chatswood, we chose the one closest to the station. This was a lucky choice, as this is the one that specialise in grilled cuisine. The interior was very beautiful, it had nice jazz music in the background. 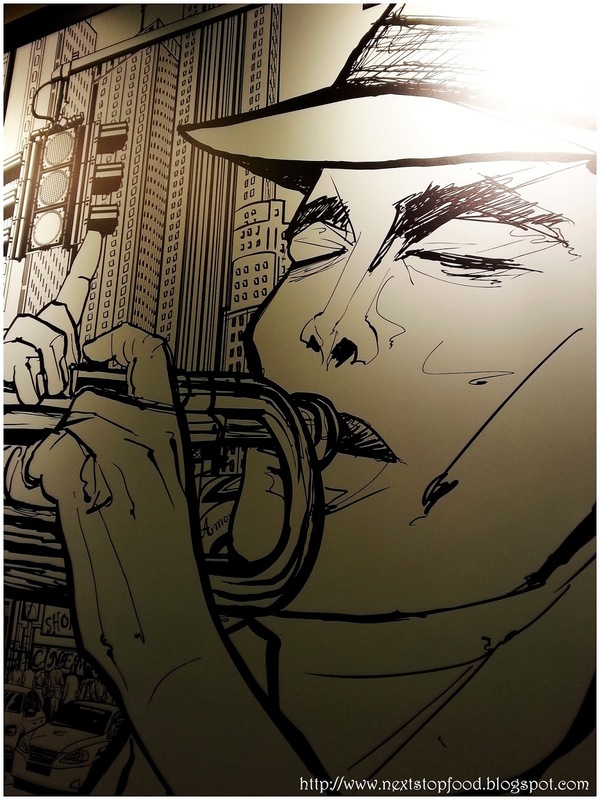 From the moment we stepped inside we were greeted by a massive painting of what looked to me like Michael Jackson on a trumpet. 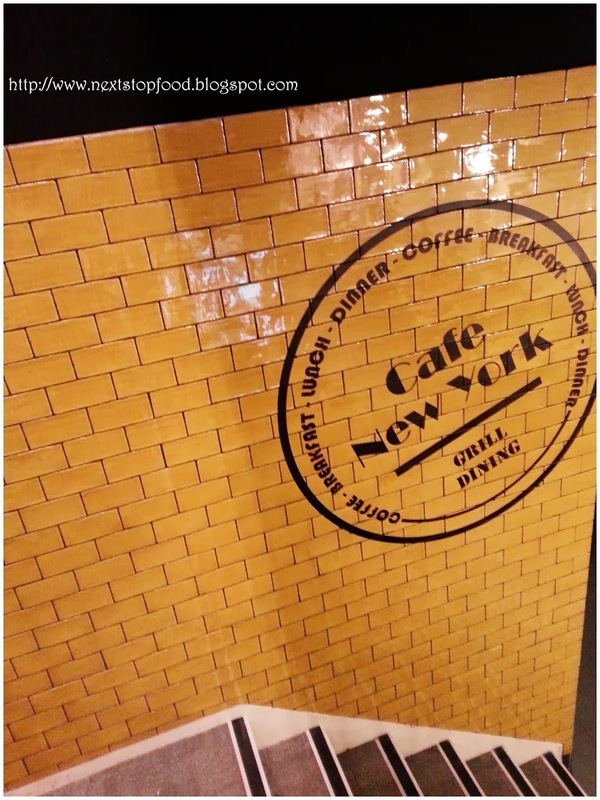 We were then led upstairs to the dining area and shiny yellow tiles. The decor was very nice and for a moment, we felt like we were in a different place. We had a very warm welcoming by the staff and we were placed on a table with a good view. Now the reason we chose to go to this restaurant was due to an interesting entree on their menu. This being crocodile and kangaroo skewers. I haven't tried crocodile before, so this would be a first experience for me and to be honest I was a little scared to try it. I have tried Kangaroo before and it was quite nice and tender, this was at a famous Brewery in WA. We were greeted by 2 waiters, one who was very helpful and the other was a trainee. the waitress was very helpful with wine selection and the food recommendations. 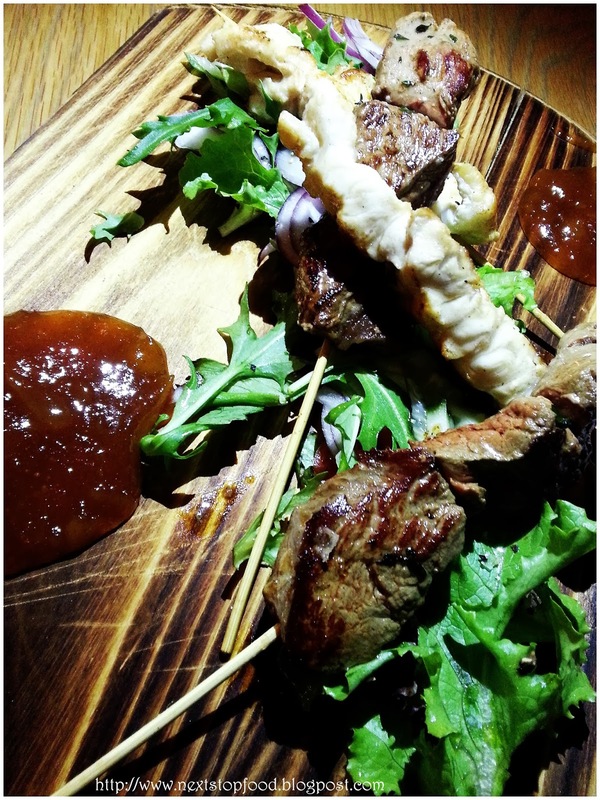 She mentioned the crocodile and kangaroo skewers with mango chutney were amazing and so we had to order them. 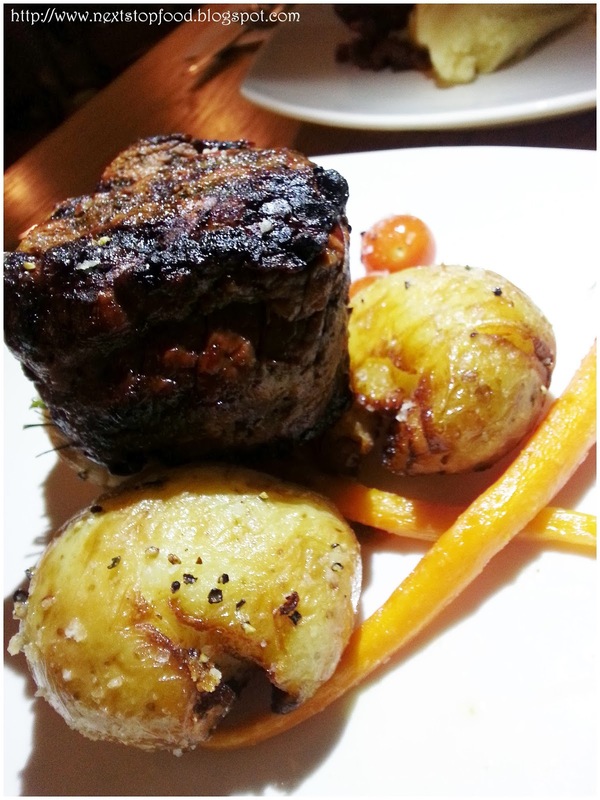 We also ordered the Lamb shanks and Scotch Fillet Steak for our mains. The time for truth has finally arrived, the skewers came out on a small wooden chopping board. The White meat was the Crocodile and the dark meat was the kangaroo. Now for the tasting....The crocodile was tender but quite chewy, if i had to compare the taste to something I have tried before, it would taste similar to chicken. The mango chutney was a great condiment to the skewers. The Kangaroo meat was very pungent, but very tender. It was a very bizarre experience and I suggest everyone to try crocodile once in their life. Moving along to the mains of Lamb shank and scotch fillet steak. 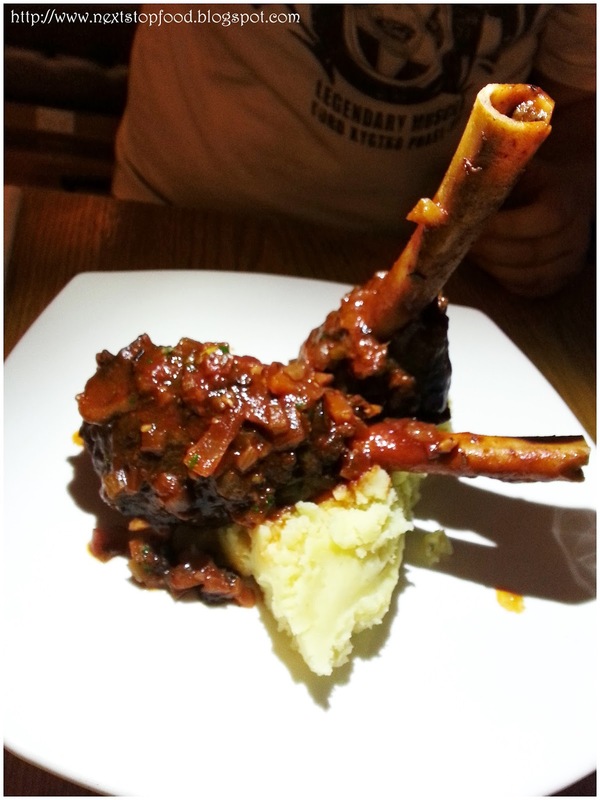 The lamb shanks came alongside mash potato, when the waitperson brought out the shanks, they were HUGE. They looked juicy and they tasted delicious. The steak looked small in width, but it was very thick in height and 2 crispy potatoes on either side. Compliments to the chef, as the food in general was very tender and delicious. 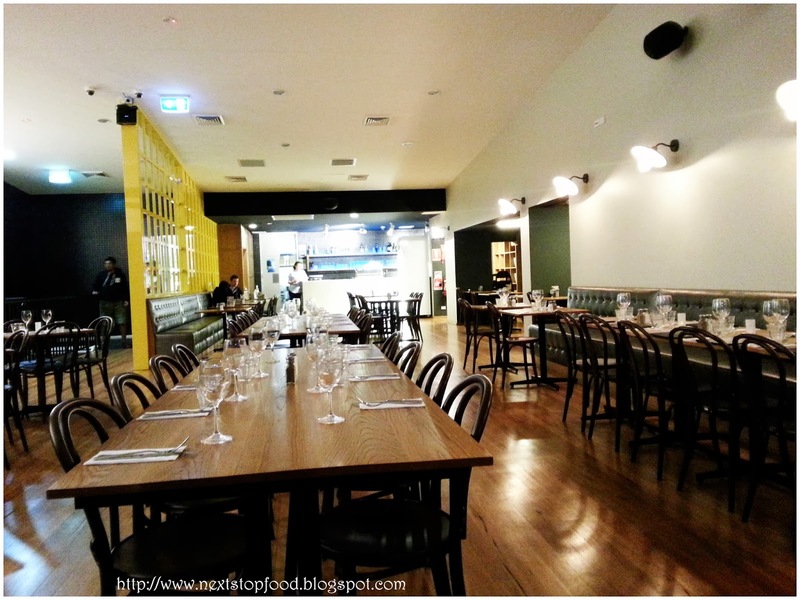 This is a very nice restaurant in the middle of Chatswood CBD. From the outside you would not have anticipated such nice decor inside and upstairs. I do recommend the food here and if you're ever in Chatswood and you become torn as to where to get a steak. Pick this restaurant, for a nice dining experience. croc skewers interesting! ive only had t in soups!